St Mary’s will vie with Panton Hill at the Whittlesea Showgrounds this Saturday to decide the 2018 premiership in Heidelberg Golf Club Division 3. “You’ve just seen the grand finalists today,” said an unbiased onlooker after the Round 5 clash between these teams at A.E. Cracknell Reserve – which Panton Hill won by 23 points. The Burra have gone undefeated from Round 6 onwards, albeit winning the Round 14 encounter at Whatmough Park against the Redbacks by just two points after trailing by 17 points or more twice in the match. St Mary’s then had a 23-point win over Panton Hill in the second semi final. The week’s rest is likely to assist St Mary’s – with coach Fabian Carelli being able to watch on as the preliminary finalists slogged it out in heavy conditions. The teams found their way to the decider via differing pathways. St Mary’s has been gradually building for some years. The majority of their team were at the club at some level back in 2014. Ruckman Jordan Galea (ruck) and midfielders Chris Petroro and Ben Mossuto have rounded out the list to a nicety in 2018. In the years since their epic one-point 2013 Division 3 grand final win, Panton Hill has placed sixth, seventh (twice) and finally relegated from Division 2 at the end of 2017. Results have been much better this year back in Division 3. Along with a new coach in Steve Layt, the club recruited well by enlisting Rhys Boyden, Nick Parks, John Pritchard, Brent Ryan and Luke Ericson. Boyden is the leading goal kicker for the season, with Parks being a likely candidate for the club’s best and fairest, while the others above have all contributed at a high level. Tim Duckworth also returned after a year with Lower Plenty. The main task for Layt and his coaching staff was to get them to click as a team – a job he said was made easier because of the outstanding qualities of his on-field leaders. Team changes are likely to be minimal for both teams for the grand final. A likely inclusion is key forward Matthew Byron for Panton Hill. He was a late withdrawal from the preliminary final and the move turned out to be a win-win for his team. It was a poor day for marking forwards and the Redbacks were able to get the job done without Byron. The better forecast for this Saturday should suit him. St Mary’s could go in unchanged. Their line-up will be virtually sealed at 11:30am when the undefeated Burra reserves run out to play Heidelberg West in the curtain-raiser. It is great for the Hawks to have a team represent them on grand final day after some recent lean years. Burra’s Nick Delanty, Ryan Peiper and James Boarotto all pushed their claims for senior selection with solid performances in the reserves second semi final. Just as the pathway of each team to the day was markedly different, the way they each team aims to get the upper hand will vary. Panton Hill will be looking to its top-end players to dominate. They would fancy Nick Parks to win the ruck duels against an improving Jordan Galea, while hoping that key forwards Rhys Boyden and Matthew Byron can hit the scoreboard. Down back, Brent Ryan may get the job on Myles Guldon, while Mitch Anderson can play as an intercept marker. St Mary’s would hope to win with its aptitude at the outside run and an overall depth of player talent. The defence has been outstanding – with Leigh Sullivan and Lee Minuz likely candidates to match up against the Redback key forwards. The Burra also have a plethora of small defenders who are adept at finding midfield targets. One grab marker Jacob Yeomans has finished the year strongly, with 20 of his 22 goals coming since Round 8. The inside midfield battle will be crucial. Scott Conte and Matthew Fowler have led the way in 2018 for the Redbacks and will have John Pritchard’s help as a runner. But they face off against Dillan Ronalds and a host of Burra midfield runners, such as Jake Drambrauskas and Lachlan Potter. St Mary’s has worked hard at winning the contested footy. If the Burra can do this, they are well on their way to Division 2 and look ready for the step up. But a tough contested footy team in Panton Hill stands in their way. 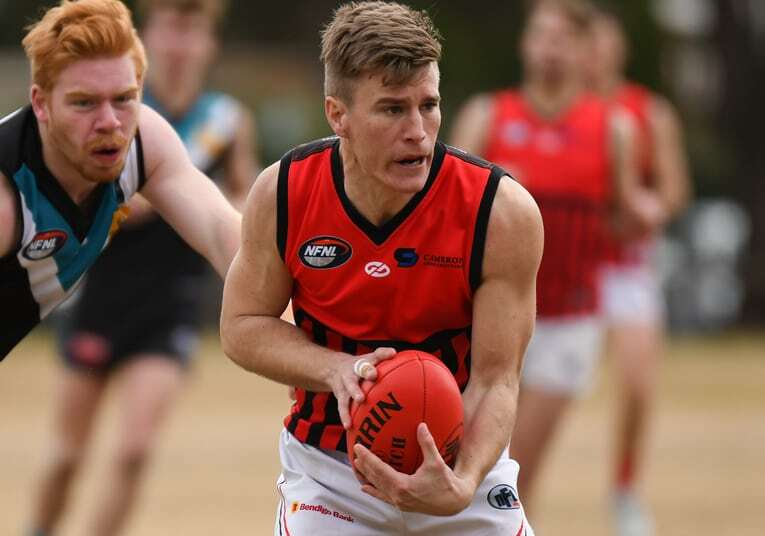 LIVE STREAM: A live stream of the Heidelberg Golf Club Division 3 Grand Final can be viewed on the Northern Football Netball League Facebook page, while a broadcast can be heard on 88.6 Plenty Valley FM.